Nearly 80% of marketing-produced presentations are changed by the field before being presented to customers. Systems that only measure the remaining 20% are missing the bigger picture—the most important part of the picture. Content Genomics tracks how content evolves and how modified versions are being used, to provide a comprehensive and accurate analysis of content effectiveness. Target the right content based on the customer and the opportunity. Focus your marketing investment on creating and optimizing content that works. Gather insight and best practices from the field and use them to improve your content and optimize your sales efforts. 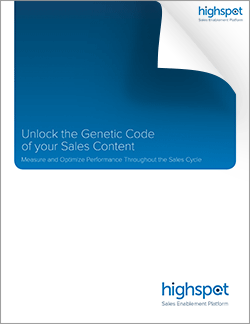 Submit the form to download our white paper "Unlock the Genetic Code of your Sales Content" and learn best practices in sales enablement and sales content management.